Alloy largely succeeds in delivering a high-quality, flexible mixing tool. Powerful Dynamics modules. Multiband mode with clean crossovers. Low-/zero-latency. Clever Macro system. Per-module input/output faders. VST3-compatible. Transient module not great. No dedicated filter module. Some minor flaws and annoyances. The iZotope brand is synonymous with quality digital mastering, with the company's Ozone 4 plug-in being one of the best finalisers we've ever come across. Many users also found Ozone to be a potent mixing tool, too, albeit a heavy-handed one. With this in mind, iZotope have come up with Alloy, a dedicated Ozone-esque 'channel strip' that's geared towards everyday mixing. The first module is an eight-band EQ with spectral analyser overlay. Filter types available per band are: bell, high/low shelf, and high- and low-pass, in normal and steep varieties. Aside from the steep filters, the EQ is much like using Ozone's EQ in Analog mode - it's nothing special, but it'll cover the majority of EQ tasks. Next up is the Exciter, which is a dedicated saturation stage. You get Drive and Mix sliders, plus an X/Y pad with which to select a saturation style or blend thereof: smack in the centre is Tube, while going clockwise from top right we have Transistor, Tape, Warm and Bright. The overall effect can be subtle (we particularly liked it on basslines), though you can push it into overdrive by using the module's input slider. There's a simple stereo Width slider, too. Like the Transient and Dynamics sections, the Exciter can work in multiband mode, with up to three bands and adjustable crossover points. Thus, you can apply different saturation styles to each band, or drive the mid-range harder, etc. Moving along, we come to the Transient module, which can independently process the attack and sustain levels in a signal. Adjusting the attack works quite well, but the sustain portion can sound artificial and 'forced' - the transition from attack to sustain can be too obvious. It's more useful in multiband mode - eg, to reduce low-end sustain on a kick drum to cure any rumble, enhancing the upper mid-range snap of the snare, or accenting elements of mixed loops. 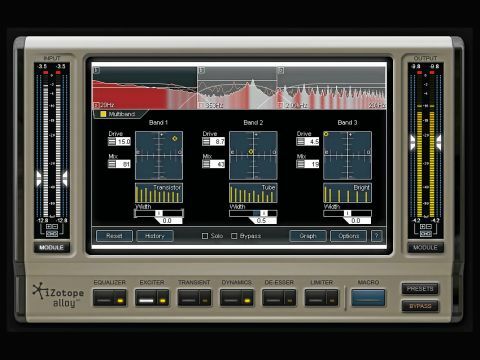 "Alloy is a dedicated Ozone-esque 'channel strip' that's geared towards everyday mixing." Far more impressive are the Dynamics modules - there are two of them, each containing a gate/expander and compressor. With minimal settings on the former, you get upward expansion, which makes sounds below the threshold louder - higher settings tend towards gating. Very fast attack and release times are possible (0.01ms and 1ms respectively), and you have a choice of Digital or Vintage styles, the former being just like Ozone's compression, and the latter giving a more lively response. Another option not in Ozone is Alloy's Soft Knee mode - one thing we're glad to see carried over is the RMS detection option, which is great for levelling signals without causing pumping (you can always catch errant peaks with the second Dynamics stage or Limiter). You can also run the stages in parallel, for parallel compression. An external sidechain signal can be routed to the expander and/or compressor of each of the two Dynamics sections, and in Multiband mode, the signal can be sent to specific bands. The Crosschaining feature, meanwhile, routes the filtered signal of one band into the sidechain of another - we found this particularly useful for ducking the mid-range in a drum beat when the kick hits, aiding clarity, especially on overdriven beats with mid-range harmonics. The De-Esser reduces sibilance in vocals - use the handles in the mini spectrum to zone in on the offending 'ess' sounds, then dial in the suppression. You can duck the entire signal (Broadband) or the sibilant range (Multiband). It works as expected and can tame harshness in other sources such as cymbals, too. The final module is the Limiter, sporting the Soft and Brickwall modes from Ozone, being more appropriate here since they aren't really clean enough for modern mastering, but they do have character. Also on the Limiter page is phase inversion/shifting and a DC filter. Most channel strips show everything on one screen; Alloy is too complex for this, but the Macro page does give you global control. It gives you the ability to group together key controls all under one screen, much like a traditional channel strip view. The area is divided into four panes, and you can allocate to each the parts you'd like to see - for instance, in our screenshot above, the upper right is a mini EQ, while across the bottom two panes we've got the Exciter controls. These MacroBlocks are ready-made layouts that you pick from a list, and for each Alloy module, there are layouts of varying sizes and complexity. For greater depth, you can define custom MacroBlocks, with faders labelled as you wish. Each fader can then be linked to multiple parameters throughout Alloy - you could define a parameter called Character that, when increased, causes the Exciter's Drive to be raised, while also increasing the gain and Q of all EQ bands. "Most channel strips show everything on one screen; Alloy is too complex for this, but the Macro page does give you global control." If you've ever used Ableton Live's Macro system, you'll grasp the concept immediately. We used MacroPresets to create a set of 'Dynamic Filters', using one Dynamics section in Multiband mode and controlling the crossover points and gain to create high- and low-pass filters, with optional gating/expansion. It's a shame, though, that you can't set a default preset to be called up whenever you load Alloy. Alloy's CPU usage is fine, and we had no issues using it on all tracks in a mix. Latency is low (9ms), and there's a zero-latency mode, too, which sounds near-identical, bar some mild distortion when using fast attack times or the limiter. In terms of practicality, while you get two Dynamics modules, there's only one EQ. Thus you can't apply low-/high-pass filtering, dynamics, then tone-sculpting EQ, as you can with pretty much all other channel strips. And while you get the History/Undo section from Ozone, it has the same flaw in its comparison system: if you wind back to an earlier version and change something, all later comparison slots are wiped. iZotope say they hope to remedy Alloy's shortcomings in an update. We found Alloy to be not just a capable mix processor but a cool creative tool to boot. Its open-ended approach flies in the face of the traditional channel strip concept, and while some users might find the flexibility to be more of a hindrance than a help, this is undoubtedly what will endear it to others. And in any case, more than 150 easy-to-use presets are supplied, grouped according to application (drums, vocals, etc) and they all have MacroPresets. For each of Alloy's modules, there are plug-ins out there that sound as good or better, but as a package, it all adds up to more than the sum of its parts, with some functionality that would be very hard to replace (eg, the Dynamics section). Overall, then, Alloy's precise, powerful Swiss Army knife approach nicely complements the kind of 'virtual vintage' plug-ins that most of us already have plenty of.